Let's face it: The guys who put the puck in the net are the ones who get all the attention -- except maybe from their coaches. Sure, you've got to put the puck in the net to win games. But you've also got to keep it out of your own net, and to do that, you've got to have players willing to sacrifice their own offensive games to shut down the opposition's big guns. As the old line goes, "It's a dirty job, but somebody has to do it" -- and there's nothing coaches appreciate more than a guy who's willing to do the hard work involved in keeping opponents off the scoreboard. 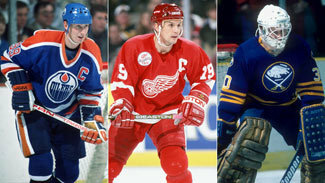 Here's a look at 10 of the great shutdown forwards in NHL history. Most of them were good offensive players as well, but they made their reputation by concentrating primarily on making sure the guys in the other sweaters didn't score. Few players in NHL history were as relentless as Peca, a rangy center whose career was slowed and finally ended by injuries -- but who in his prime was a superb two-way center who made life miserable for opponents. Peca won the Selke Trophy as the NHL's best defensive forward with Buffalo in 1997, finished second the following season, then won it again in 2002 when he led the New York Islanders to their best season in a decade. His skills as an open-ice hitter belied his size, and few players were better at gluing themselves to an opposing center. Peca was never the same after a serious knee injury suffered in the 2002 Stanley Cup Playoffs, but in his prime, he was as good a shutdown center as there was in the NHL. Were it not for the fact that Ramsay was a contemporary of Bob Gainey, he might well have more than one Selke Trophy on his mantle. Ramsay, who spent his entire career in Buffalo from 1971-85, finished second to Gainey three times in the first four years the Selke was awarded before winning in 1985, his final year in the NHL. Ramsay and close friend Don Luce were one of the NHL's best pairings of defensive forwards in the early 1970s, and when Danny Gare joined them in 1974-75, the Sabres made their first trip to the Stanley Cup Final. For all the brilliance of the French Connection line, Ramsay and his linemates were every bit as valuable to the Sabres for their two-way skills. Keon's career predated the Selke Trophy, but his skills as a relentless checker and faceoff fan, combined with hockey smarts that were second to none, made the speedy center one of the NHL's best defensive players of the 1960s. Keon was a key part of Toronto's four Cup-winning teams in the 1960s, and his defensive skills were never more in evidence than in the 1967 Final, when he shut down Montreal star Jean Beliveau to help the Leafs win their fourth championship in six years. Though he had only eight points during the playoffs, his defensive performance earned him the Conn Smythe Trophy as playoff MVP. No non-goaltender has had fewer points and won the award. The speedy center could put the puck in the net as well -- he finished his career with 396 goals and 986 points -- but it's his shutdown ability that Leafs fans remember him for. Madden finally hung up his skates this summer -- much to the relief of opposing forwards whose lives he made miserable during his 13 NHL seasons. Madden was undrafted and signed with New Jersey as a free agent after four years at the University of Michigan. He was a big scorer in the minors (98 points in 75 games with AHL Albany in 1998-99), but quickly turned into a defensive specialist and penalty-killer supreme for the Devils, helping them win Stanley Cups in 2000 and 2003 (and a third with Chicago in 2010). He won the Selke in 2001 and was the runner-up in each of the next two seasons. Madden and longtime left wing Jay Pandolfo were among the NHL's best penalty-killing tandems in the 2000s and were a key to the Devils' stifling defensive system. Brind'Amour's reputation was greatly aided by the arrival of more comprehensive statistics, which quantified what many already knew -- that he was one of the great faceoff artists in NHL history. Brind'Amour was more of an offensive threat in his first half of his career; he had four 30-goal seasons and three seasons of 85 or more points in the 1990s. But his all-around game came to the fore after he was traded to Carolina in 1999-2000 -- his offensive numbers tapered down but he became a better defensive player and leader, winning back-to-back Selke Trophies in 2006 and 2007 and leading the Hurricanes to their only Stanley Cup in '06. Francis is fourth on the all-time scoring list and has more assists than anyone in NHL history whose last name isn't Gretzky, so it's easy to forget that he was a superb defensive player as well as an offensive force. Unlike many top scorers, Francis was more than willing to backcheck and do a lot of the dirty work involved in shutting down opposing centers. He won the Selke Trophy in 1995, finished second the following season and also took home the Lady Byng Trophy for skillful and gentlemanly play three times. Pittsburgh's acquisition of Francis and defenseman Ulf Samuelsson from Hartford at the trade deadline in 1991 turned the Penguins into a two-time Cup winner. Lehtinen had some offensive skills -- he had seven 20-goal seasons and broke the 30-goal mark twice -- but it was his willingness to play defense that made him such a valuable member of the Dallas Stars from 1995 through 2010. While players like Mike Modano focused on putting goals on the scoreboard, Lehtinen concentrated on keeping the opposition from doing the same. Lehtinen won the Selke Trophy for the first time in 1998, repeated the following season when the Stars won the Stanley Cup and took home the trophy for the third time in 2003 after scoring 31 goals and finishing plus-39. He was also second in 2006. Though injuries slowed him down after that, Lehtinen never finished with a minus rating until 2009-10, his final NHL season. Carbonneau was an offensive terror in junior hockey -- he scored 72 goals and 182 points with Chicoutimi in 1979-80 -- and had 88 and 94 points in two seasons in the AHL. But when the Montreal Canadiens brought him to the NHL in 1982, he became a checker par excellence -- following in the footsteps of longtime Habs defensive ace Bob Gainey. Carbonneau won the Selke Trophy three times in a five-year span from 1988-92, and finished second in 1987 and 1990. He was the captain of the 1993 Canadiens, the last Montreal team to win the Stanley Cup, and helped shut down Wayne Gretzky in the Final. His defensive skills helped him earn a third Cup with Dallas in 1999. If there were an award for thievery, Datsyuk would win that one as well -- few players in NHL history have been better at taking the puck away from opponents than the speedy Detroit center. His ability to take the puck away from opponents is a big reason Datsyuk won the Selke Trophy for three years in a row from 2008-10. He's also a premier offensive player -- Datsyuk scored 97 points in each of his first two Selke seasons and has averaged just under a point a game for his career. Datsyuk makes life miserable for opponents with his speed, skill, positioning and ability to control the puck, and he does it without taking a lot of penalties. He won the Lady Byng Trophy four straight times, including his first two seasons as the Selke winner. For a while, it looked like the NHL should just give Gainey the Selke Trophy and have a new one made -- the longtime Montreal Canadien was named the best defensive forward in each of the first four seasons the trophy was awarded (1978-81). It wasn't until 1982 that Boston's Steve Kasper edged him out -- Gainey came in second. Gainey never had more than 23 goals or 47 points in a season, and finished his career with only 501 points in 1,160 games. But his ability to keep the other team from scoring was a major part of the Montreal dynasty of the late 1970s -- he was a member of all four championship teams from 1976-79 and helped the Canadiens win again in 1986. In an era when seemingly everyone could score, finding forwards who could shut down opponents was key to winning. Nobody did it better than Gainey, one of the few forwards inducted into the Hockey Hall of Fame primarily for his defensive skills.